Choir members meet Thursday evenings from 7:00 to 8:30 pm for a time of fun, laughter and lots of singing!If you like to sing, we would love to have you join us. ​We have a group of approximately 25 awesome singers who are the dedicated to attending rehearsals and who like to have fun! The choir enjoys sharing our music with the community and perform at different venues through the year. Anthems are sung every Sunday morning and include many different styles of music. Secular music is incorporated into all of our programs and the choir performs at least two concerts per year and take a well deserved break during the months of July and August. What musical instruments are played at Ravenshoe? 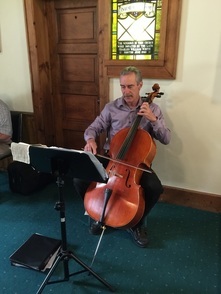 Prior to services each Sunday morning and during the singing of hymns, the congregation will hear Kathy at the piano, Philip playing either cello or violin and Wayne playing violin, guitar or mandolin. Children accompany the congregation with rhythm instruments during the singing of the children's hymn.